These are basically clip shows with talking heads and a generic narrator to link up the talking heads. In practice, this one is narrated by David Tennant and Steven Moffat, who do most of the heavy lifting of actually explaining the Hartnell era. They slot into their respective roles quite well. Tennant enjoys giving the sort of official factual fan history, dutifully trotting out the basic descriptions and acting as the sort of head teacher and guide. He's good at it, providing your basic factual history. What's more interesting is Moffat's role. Moffat, as executive producer, now, as he's put it, doesn't get to have opinions about Doctor Who anymore. But here he's called on not only to have opinions, but to contribute to a narrative of how Doctor Who has always been brilliant - a narrative that we know full well he doesn't actually subscribe to, because he's too much the critically-minded professional to forgive things like The Web Planet. The magic of this, though, is that he handles this challenge not by doing what one suspects Russell T Davies usually did to arrive at his "it's all marvelous" policy and simply lying through his teeth, but by actually identifying small bits that he thinks work well. The result enlivens this considerably, because you have Moffat picking up on small and odd details that he loves - for instance, he gives a quite enthused account of how The Daleks is satisfying because it's not actually building the Daleks to return, and so they have their own self-contained concept, which makes them work better. One suspects that this is more or less the only thing he likes about the Daleks, along with the Dalek reveal and the first cliffhanger. But it's a compelling case, and actually looks at The Daleks as a weird historical artifact. His accounts of why Barbara works and of the Doctor's declaration that he's going to fight the Daleks in The Dalek Invasion of Earth are similarly magnificently chosen details. And this, in many ways, captures what's genuinely nice about this take on Hartnell, which is that it doesn't just do An Unearthly Child and The Daleks, but instead actually looks at the way in which the Hartnell era is its own thing. Indeed, the first few minutes of the program are spent freely admitting that the Hartnell era looks very weird today. And it focuses on things that aren't part of the usual narrative - it even gives a peek at The Gunfighters, albeit one that consists of John Barrowman doing a ludicrously performative account of how ridiculous it is followed by (in the episode's most sublime shot) Caro Skinner giving a very dignified and professional assessment of how striking the episode is that is blatantly based on the single publicity still someone showed her immediately before she gave her answer. But a vision of the Hartnell era that accepts The Gunfighters as something to celebrate, even if only for its insanity, still feels like progress. Certainly it's better than the Bentham orthodoxy, even if it's still clearly reacting to it. More frustrating is what it leaves out, which is basically Vicki, i.e. the actual most popular bit of the era in terms of being watched by people. The Ian/Barbara/Vicki team is the iconic Hartnell cast - the one that made up the center of the era and that got the best ratings. Instead it focuses on the creation of the series and the modernizing of it right before it was handed off to Troughton. 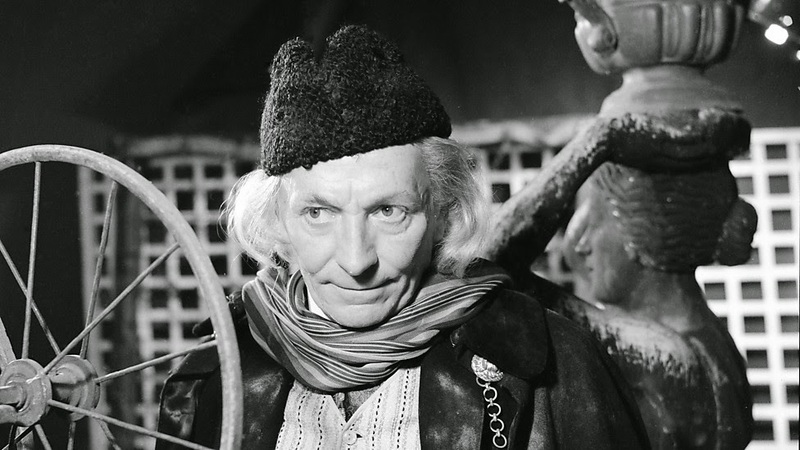 The result is that the Hartnell era never quite gets to be itself. It's treated only in terms of how it contributes to the rest of Doctor Who's history. It's treated with love and appreciation, but less for what it did and more for what it set up. It's still a better treatment of the era than the sort of historicized distance with which it's been treated in past attempts. One at least gets the sense that the Hartnell era was something, and the idea that people might enjoy watching it on its own merits feels like it's actually being taken seriously, which is genuinely satisfying. It's probably the best account of the Hartnell era by a BBC-authorized source to date, in that it gives a sense of weirdness and quality, which are, in practice, the two defining characteristics of the era. But there's still a frustrating sense of omission here - a sense that the true weirdness of the era isn't allowed to thrive. ← “Someone who's loved you forever”: Are You Serious?! Shocked at the Beach, Wedding Panic! Delay as much as you like - I'd rather savour it than rush it, especially if it's filled with tidbits like this that'll round off the project with every angle you want to explore explored. Agreed. I'll be sad to see the end of regular Eruditorum posts so the more you can prolong it the better. Surely there must be a way to extend TARDIS Eruditorum until, say, the Spring Equinox? I first encountered the Doctors Revisited completely by accident. I was looking to buy the Paul McGann movie on DVD (long story), and noticed this series sitting right next to it. For the same price as the 1996 film, I could also get Earthshock, Vengeance on Varos, and Remembrance of the Daleks? Well, as much as I liked watching the special features, and had enjoyed watching them the first time around on Netflix, this was too good of a deal to pass up. The other set included The Aztecs, Tomb of the Cybermen, Spearhead from Space, and Pyramids of Mars. Especially fun is that the episodes are listed at "special features", so the Doctors Revisited program itself is only 100 minutes long, with 700+ minutes of special features, according to the back matter. If you like owning physical things but aren't going all in for the exhaustive collection, both sets are quite good packages for your money. The specials themselves are quite interesting also, especially the McGann one, but Phil will go into that in greater detail I'm sure. Of what little I've seen of the Hartnell era, "Edge of Destruction" has been my favorite bit for how fabulously weird it is, for providing the first hints that the TARDIS might be sentient and for Susan going delightfully knife-crazy. More and more, I'm regretting coming aboard this blog so late, and for paying attention so perfunctorily. It's almost over, and I could have been enjoying it and taking part in it. But, no, silly me. Thanks for everything, Phil. Here's to the home stretch. Given we have been told that Eruditorum is explicitly intended as a magickal working, surely such a concluding date would be most appropriate. Phil, I think I speak for just about everyone when I say that what annoyance I currently feel is exactly the opposite of "how much I'm delaying ending this thing". It's more sort of, "I wonder if we can find a way to give him 'Doctor Who' episodes from the future so he can keep writing this?" Yes! That sounds perfect and I would personally *love* the extension. Though if that is the date you have settled on Phil, completing just after the festival of Imbolc is good too, a time of renewal as the tender shoots of Spring first rise, which fits in well with the regeneration of the Eruditorum into a new form. Anyway, I still want it extended, so roll on Spring Equinox! I really enjoyed watching these specials as a part of the build up to the 50th Anniversary. The programmes covering the earlier Doctors I really cherished as I agree with you Phil that there is still a lot of ground to covered around really appreciating Hartnell's time and what he did, and especially understanding of the real weirdness that flourished in the show then. One of the things I have enjoyed about your blog Phil has been your coverage and love of that wonderful weird period. Just carry on writing about Doctor Who and I'll carry on reading what you write and enjoying it and joining in the commentary. I know the nature of this project demands an end point but I'm in no hurry to get there. Didn't we already get the final essay anyway as part of your timey wimey River Song sequence? Oh, and thank you for this extra thing. As one of the ahem...older commenters here I appreciate any love shown for the era that I consider my Doctor. I meant to add also that I felt a genuine surprise and pleasure at seeing these shows getting coverage by you Phil. I'm with Anton below, the more you write about Doctor Who, the more I'll read, and yes also having the added valuable experience of conversing with you and everyone else around your work is a real pleasure. I demand you stop NOW. This minute. Walk away from the keyboard and don't look back. Kidding! No rush. I don't think it's that people are eager for your project to be over so much as that they're eager to get to the "meat" rather than the peripheral stuff not everyone saw or read. As for me, I watched most of these on a plane at one time or another, so I'm going to really appreciate your commentary on them. I've been really slow at catching up with the Hartnell era; I've never been eager to sit through a recon and I've only bought a few of the DVDs. What I've seen has been pretty terrific if at times hard to sit through. Please, take all the time you want! Now that you're jumping back to add to previous eras, does this mean you're planning to write about "Night of the Doctor" on the blog rather than waiting for the McGann/Eccleston book? I also think it might be interesting to speculate on the choice of episodes to represent each Doctor. This special was followed by "The Aztecs". Now, I think this is an exceedingly good story, and in many ways it works even today, but I wonder if it was the right choice for this project? Asking a modern-day audience to slow down and watch 90 minutes of slower paced black-and-white Doctor Who is already a big ask. Choosing an historical, even one as highly regarded by fans as "The Aztecs", might have been a bridge too far for some. I think "The Time Meddler" might have been a far easier story to slip a modern-day audience into. I just think it holds up better - at least for a first-timer. The glacial pace at which we've moved through the past few years of the show has made it rather hard for those of us who enjoyed the brisker pace used for earlier eras. I wonder if part of the problem is trying to write about an era that is still very much ongoing. I have a feeling when all is said and done, one's ability to comment on the Matt Smith years will only be most effective after Moffat finishes out his run after Series 9. In many ways, the transition to a new producer will mark a much stronger dividing line for the historians wishing to 'understand' this era... but what can you do? The alternative would be to stop writing altogether until that date, and no one would be happy with that. We have already seen this problem to a small extent when Mr. Sandifer in his review of "Death in Heaven" spoke of Clara's departure as if that was a significant thing, when she departs in practically every episode of her time with the Doctor, and in fact, is coming back in just a few weeks. It is the price one pays for commenting too close to the time of transmission. In any event, I dare say that the eventual book publication of the Matt Smith era will have to go through some rather substantial rewrites once knowledge of how Moffat finishes out his term is known. That is not to say that this isn't a worthwhile exercise. On the contrary, writing about the Smith era when we haven't finished Moffat's run on the show does provide some worthwhile insights. What I think shall be truly interesting to explore will be the Capaldi era under a different showrunner. We haven't had that sort of situation in which the Doctor remains the same but the producer changes since the 1970s - and I think in many ways the transition from Hinchcliffe-Baker Who to Williams-Baker Who has more impact on the story than between any of the Doctor changeovers of the 1980s under the same producer. It's a good question. Personally, as problematic as I find certain aspects of "The Aztecs," I think it's a better choice because (a) it's representative of the only era in which pure historicals were common and (b) it features Ian and Barbara and Susan, who are not only my iconic cast but also the one viewers would see the most of in Adventures in Space and Time. Plus I generally -- I know this is weird -- enjoy it more than I enjoy "The Time Meddler." But your logic makes a lot of sense, since "Time Meddler" of course invented the only type of historical we have today. I wanted to throw my hat in the ring to praise Phil for his excellent work over the last four years. You've come up with a whole new way to think and write about Doctor Who, exposing us to potentialities in the show that we didn't even know were there. And even though the Eruditorum is coming to an end, its affects are living on for a long time. I've actually cited you in a contribution to an upcoming book as a central example of new means of humanities scholarship and theoretical writing that's developing outside the increasingly moribund and compromised university system. I dunno -- I think the differences between the Davison years and the C. Baker years and the McCoy years are at least as massive as the differences between the Hinchcliffe years and the Williams years. Part of that is of course the script editor changeover, which I think supports your point -- since the showrunner is essentially filling that role now. I truly can't imagine Capaldi under anyone else. But then I can't imagine the show under anyone else right now. My dream showrunner at this point is Gareth Roberts, but I can see the Neil Cross of "Luther" (as opposed to the Neil Cross of "Rings of Akhaten") doing some interesting (and perhaps just too dark) things with Capaldi. BBC America specials are often too simplistic and frustrating. I understand the simplistic part; the typical American audience hasn't spent as much time as I have reading about the show. But they often leave out a lot of interesting things and different POVs. I stopped watching most of the specials after the companion one in which all several celebrity guests could say about Amy was that she was pretty. I guess that's another reason doing the River posts out of order was a cagey move: surely nobody can accuse Phil of postponing the end of the Eruditorum when he already put up the last post months ago. We already know the end, and the end isn't the point anyway. That said, I'm curious to see how this is going to continue for almost another three months, even covering all these BBC America specials. But I'm sure whatever Phil has in store will be worth it. I guess it might seem skewed to spend so much more time on the recent past compared to the general overview entire decades got, but this is the show's 50th anniversary we're talking about. Surely if any point in the show's history deserves close scrutiny, it's this period, with all its attendant hullabaloo. It's obviously a good way to sum up everything the Eruditorum has said over its run, and offer a last look at the show's history as a whole. This special was actually my first time watching the Aztecs. The way the HD broadcast treats the source material is very strange, they do that incredibly annoying thing where they stretch the edges of the video out (so that, topographically, it kinda looks like a flattened cylinder). It's at times miserable looking, but you have to just muscle through it and enjoy it best you can. There's a lot of room to criticize later specials' episode choices, and I think we'll get there eventually. Sure, there's not a lot of choice for some Doctors, but I think the way they went with Eccleston at least deserves some raised eyebrows. I think the ideal showrunner would be George Lucas. Just think of his deft way with dialogue! Actually, when I first watched it, they didn't do that stretchy-thing; from what I recall, they put a "Doctors Revisited" logo on either side to pillar-box it. I didn't care for these specials. As an old crusty American fan, I don't even like to be called "Whovian" let alone the BBC America "Why I love the Doctors" specials. Have you don't a Euridium about how Chris Hardwick has taken over commercialized fandom? Don't. I never want to see that nitwit again. 1. two short, trite, and probably annoying to NuWho because it talks down to them and older fans at the same time. 2. the shoddy quality of the stories (unrestored) that accompanied them.